Welcome to Wow. I haven't said it in a while, but I truly appreciate each one of you for taking time to come join this party. It is so great finding all this inspiration in one spot. Y'all are a very talented bunch. Lots of super links last week so let's look at a few. 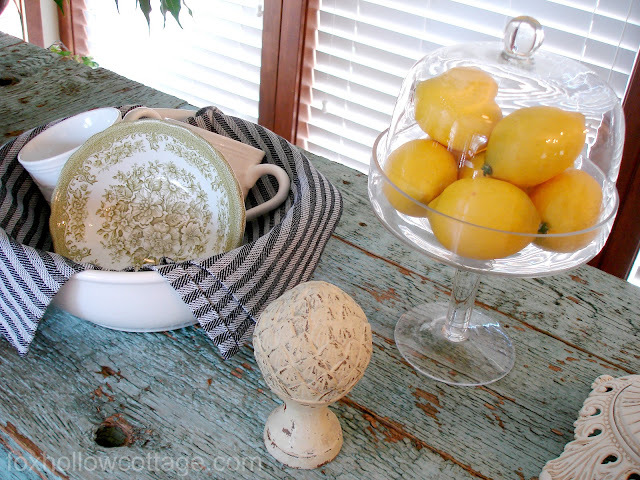 Blue Creek Home shares her fabulous kitchen makeover. Loving that subway tile wall. You should see how this kitchen was transformed with beautiful moldings added to the cabinets by Remodelando la Casa. This wall went from boring to spectacular with the perfect stencil for the age of this home. 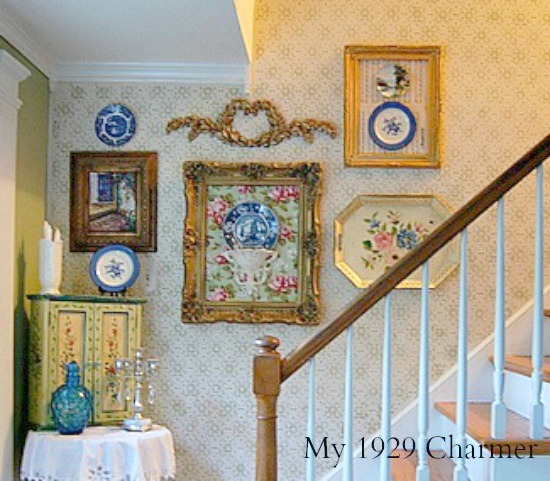 Check out the before and after at My 1929 Charmer. Domestic Imperfection shared how to add this wonderful planked wall in her kitchen and breakfast room. 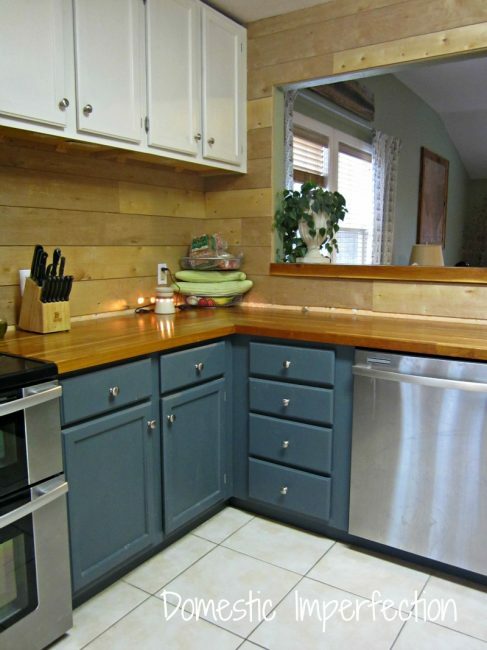 Love this counter top made with old cedar fence boards. Such a great idea by Fox Hollow Cottage. Great way to repurpose and old window. Love how Liz at Savvy Seasons made this pot rack from one. 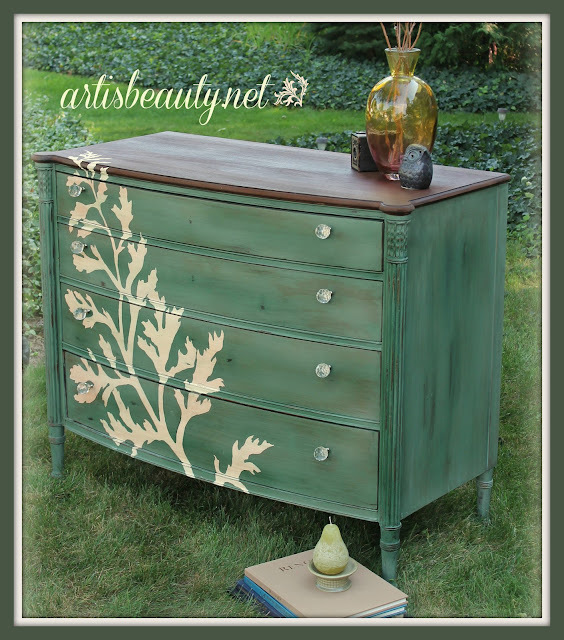 Beautiful dresser transformation by Art Is Beauty. Great color and love the hand painted fern. See I told y'all lots of inspiration. I hope you will visit these sites if you haven't. If you were featured feel free to grab my "featured" button from my sidebar. Be sure and check out the most viewed links that were shared earlier today, too. Now we are ready to see your wows this week. 1. Please have a link to this party in your post or add my party button from the sidebar. If there is no link you will not be featured and/or could be deleted. 3. Please be a follower of this blog either through GFC or Linky Followers or both. 6. No link parties, please. 8. Would love to have you follow me on FACEBOOK. If you want to pin a picture to Pinterest please click on the picture and pin it from the original source and not my blog. Thanks. Beautiful features from last week! !...Loved all the transformations! Thanks for hosting Kim! Have a great week! Thanks Kim for hosting this great party every week! Thank YOU for always hosting such a fantastic party Kim! I love all of the features and I'm off to visit everyone. Thank you again Kim! Wonderful features Kim. Thanks so much for hosting WOW! Love Fox Hollow's countertop - the color is amazing! And Art is Beauty did a great dresser! Thank you so much for the feature, Kim!! and thanks for hosting once again a wonderful party! Hi Kim, really love that great pot rack! just linked up, thanks so much for the great party! Love checking out all of the inspiration! Thank you for the party Kim! I hope you had a great Labor Day Weekend. Kim, I'm really loving that old window/pot rack! How adorable and smart is that?!? I'm glad I can link up this week with a recipe that I really love!! Thanks for hosting another fab party! Fabulous features. I just can't get over the kitchens. Thanks for hosting Kim! I love that beautiful painted dresser and the window is such a clever idea as a pot rack. Thanks so much for hosting Kim. Thanks for the party, glad to be here! LOVE that stenciled wall and stairway. So cute! Thanks for hosting, Kim. Hi Kim; such great features this week. Thanks for hosting. Kim, these are great features! Thanks for hosting! Oh wow! I always love to see kitchens redone. Thanks for hosting the party. Love the features this week. Thanks Kim for hosting. Hi Kim: Such beautiful features this week--love Cathy's new wall stencils and the dresser is so cool. I have a couple of old dressers just sitting around, and I've been looking for fun ideas for them, so thank you for bringing all the inspiration forward each week when you host this fun party! Thank you so much for hosting again this week, I really appreciate it!! Love the features Kim! Liz has done some very cool "hanging" things...love them! Wow, it looks like kitchens have been HOT lately! So many redos! Thank you kindly for hosting again, andrea b. It is looking good over here! Thanks for hosting! Great features! I especially love that chippy counter and that window turned rack.Thank you for hosting! Thanks so much for hosting this great party each week. Wonderful features! Hope you have a great Wednesday and beyond! Great features! Thank you for hosting yet, another terrific party at Wow Us Wednesday, dear Kim. Have a nice rest of the week. Thanks for hosting. Hope you are having a great week. Thanks for hosting a fun party! Love all the features. Kim, Thank you oh so much for featuring my dresser!! Thank you, Kim, for hosting such a successful party. I always seem to get get a lot of guests who visit from your blog. That is so sweet, and I really appreciate the time you put into it that makes it so fun to visit. Kim, I know we all really appreciate YOU! You offer wonderful inspiration with every post and hosting this fantastic party each week is the icing on the cake. Thank you! Thrilled to be featured this week Kim. I am in great company for sure. Thanks so much. Linked up a much smaller make over this week.Thanks for hosting. And thank YOU, Kim, for always hosting. It's an awesome thing! Hello Kim, thank you for hosting a great party! Today I'm posting what I consider my favorite room in the house! This is the 1st time I've posted on WW on your BEAUTIFUL blog and I'm thrilled to be here with so many talented folks! This linky party has so much great information out there to peruse I'm going to be up all night just looking at last weeks entry's, then its on to today's posts'! Thank you again Kim for hosting! Thanks for hosting Kim! Amazing to see how many projects are already linked up!! Holy kitchen! I am loving the subway tile! Great inspirational features, Kim. Thanks for hosting. Thanks so much and I'm thrilled my Cottage Stencil Wall was featured. You made my day, no week! Thanks for always hosting a great party. Thanks so much for hosting, Kim. It's always so much fun to participate in this great party! Thank you for hostessing. Love your features for the week, especially the dresser with the branch. Beautiful. Hope you are having a great week. Wow! Look at those great features! Fox Hollow's shelf is amazing, isn't it?? Thanks for hosting and letting me share. Thanks for hosting! So happy to be linking up this week. Off to check out some of the participants now. Gah! I can't believe that I'm so late to the party! Too bad I didn't make a "grand" entrance. lol Thank you for hosting, Kim. I so wish I had something cool to add to this party, but I haven't gotten anything done in my house for weeks. I'll have to life vicariously through other blogs. Love Shannon's countertop! Wowed for sure. Amazing featured blogs. I can't wait visit and follwo and comment and be wowed even more! Wish I could join this party but, I have nothing to wow anyone right now! lol. I'll just be happy to be wowed. Great post! As usual.....absolutely AMAZING inspiration over here! I love that dresser from Art is Beauty! Thanks so much for hosting! Have a blessed and wonderful day! I absolutely love that chest. Everyone's projects are so fab. Thanks for hosting! Thanks for hosting Kim! Awesome features! Kim, I love that kitchen with the subway tile; it's beautiful. Thanks for a great party every week. Wonderful features Kim! Thanks for hosting! Great features as always Kim, thanks for hosting! Great Features! So glad I was able to put my Scripture Hutch on! Better late than never!! Thanks Kim! Thanks for the party~ I love this party - so much inspiration every week - and you know I LOVE your red stool - red is such a warm happy color! I need to try that color and miss mustard seed paint especially.